The Chechnya link to the Boston Marathon bombing suspects petered out when an extremist Chechen group claimed no connection to Tamerlan and Dzhokar Tsarnaev. And although the brothers used religion as a reason, a link between them and Muslim terrorist groups doesn’t seem to exist. So, if this incomprehensible act of violence was not classic terrorism, what else could it be? How could young men whom many people described as “lovely” and “talented” intentionally inflict such unrelenting pain and death? Another way to reveal the twisted turning points on the path that led the Tsarnaev brothers to set off two bombs on April 15, 2013 is to look at their lives through a trauma-informed lens. That lens prompts an entirely different set of questions. It zeros in on a person’s childhood, where seeds of despair, anger and discontent are planted. Looking at the Boston Marathon bombers through a trauma-informed lens is not the same as investigating how they committed their crime, or identifying an immediate motive. Instead of attributing the starting point to being “radicalized” or “self-radicalized”, a trauma-informed lens reveals what a family experienced, and what a community did or did not do for a family and its members on their journey to the point where they decided to use violence. But if we want to prevent these anger-fueled attacks, it’s a critical approach to take. Fortunately, Tamerlan and Dzhokhar Tsarnaev will never have the opportunity to kill again — one is dead; the other will be executed or never leave prison. But knowing how a person grows from a beautiful baby boy into a murderer may help us as a society develop systems to drastically reduce the risk of growing more murderers. What the research shows absolutely unequivocally is that, notwithstanding a brain injury (which is not out of the question for Tamerlan Tsarnaev), people don’t snap. People don’t turn into bombers out of the blue. Happy, well-adjusted, successful people whose lives intricately flow and entwine with those of their communities aren’t likely to be “radicalized”. The CDC’s Adverse Childhood Experience Study — the largest public health study you never heard of — shows a direct link between childhood trauma and violence, as well as mental illness and adult onset of chronic disease. The ACE Study measured 10 types of trauma. Five are traditional abuse and neglect — physical, verbal and sexual abuse, and physical and emotional neglect. Five are family dysfunctions — a parent who’s an alcoholic or addicted to other drugs, a mother who’s battered, a family member in prison and loss of a parent through abandonment or divorce. However, childhood trauma, which causes toxic stress, can also include war, natural disaster, witnessing violent crime, being homeless, and moving frequently. The more ACES you have — i.e., the more types of trauma — the higher your likelihood for committing violence, being severely depressed, committing suicide, becoming obese, having diabetes, heart disease or cancer. Neurobiological, medical and epigenetic research explains the link: Toxic stress damages children’s developing brains, and leads to a host of behavioral and learning problems. It also damages the body’s systems, including cardiac, gastrointestinal, reproductive and immune systems. Toxic stress can also turn genes off and on. Exposure to war and a refugee life. They were born into a family and a community with a recent as well as a long history of experiencing forced relocation and war. They moved from one unsettled, violence-ridden land to another, before emigrating to the United States in 2002, where Anzor Tsarnaev claimed refugee status. Undoubtedly, their extended family experienced or were close to people who experienced severe deprivation, injury and death. Did the moving and the family experiences affect the brothers’ feelings of safety? Did they end up regarding the world as a dangerous place? Were they angry that their lives were more difficult than those who didn’t experience war? Did they believe that people in the United States had no empathy for them? Unstable family. The family went through at least one long separation and began a slow unraveling. 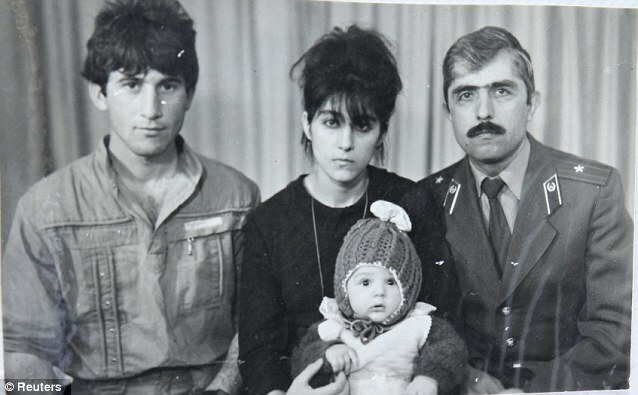 When Anzor Tsarnaev and his wife, Zubeidat Tsarnaeva, moved to the United States in 2002, they brought Dzhokar, and it was a year before the older siblings joined them. A person who visited the Tsarnaevs reported noisy arguments, a chaotic household, and that Zubeidat began spouting conspiracy theories. She was arrested for shoplifting in June 2012, skipped bail, and moved back to Russia. Bloomberg News and Politico reported that the Tsarnaevs divorced. Was there verbal and/or physical abuse in his parents household? Did the brothers witness this? Did it cause anxiety, anger and depression in the brothers? Domestic violence. Tamerlan Tsarnaev was arrested for engaging in domestic violence with one girlfriend. He was verbally abusive to the woman who is now his wife, and isolated her from her family and friends. When asked about the domestic violence arrest, his father, Anzor, seemed to dismiss the behavior by saying that he “hit her lightly.” When Tamerlan went to Dagestan for six months last year, he was separated from his wife and two-year-old daughter, although he Skyped regularly. Was there verbal and/or physical abuse in his household? Was he becoming more angry and out of control? Uncontrolled anger. Back in U.S. in the last few months, Tamerlan shocked the congregation in a mosque when he shouted angrily, once objecting to celebrating American holidays and another time when he called a preacher a non-believer for saying that Martin Luther King, Jr., was a great man. Did anyone from the mosque intervene with him? Did anyone intervene in his family? Failing in school. Dzhokar apparently did well in high school, but began struggling in college, where there was less structure. Last year, his parents left for Russia, and his brother also left for six months. The New York Times reported that a school transcript indicated that he failed seven classes over three semesters. One of his friends says he smoked marijuana every day. Was he depressed? Did he have any solid support system besides his brother? Was he disconnecting from school and friends? Isolation. The brothers’ uncle said he had no connection with “that family”. He called the brothers “losers” and that they were angry because they could not assimilate. Tamerlan told a photographer who was doing a photojournalism project about him that he didn’t have a single American friend. Dzhokar appeared to have close friends, but adored his older brother and tried to emulate him. When Tamerlan returned from Dagestan, Dzhokar was failing in school. Did he give up trying to assimilate, as Tamerlan appears to have done? Did a school counselor notice his grades and intervene? How disconnected was he, since he appeared to live two distinct lives? Most immigrants have gone through similar experiences and worse, and yet they’ve assimilated and succeeded. Most don’t commit mass murder. Did those immigrants who “make it” have more resilience factors in their lives, such as assistance from the refugee community; solid connections to an extended family who helped them with housing, jobs, and showing them the ropes; advocates who provided assistance at critical junctures; access to community services? Were they fortunate enough not to witness domestic violence, or avoid the experience of being abused or neglected? The research and the data are pretty clear about how to damage a child so that s/he becomes morbidly obese or smokes like a chimney or drinks like a fish or becomes a workaholic or slogs through life in a fog of depression or beats up and/or kills people. But what researchers don’t know is which path a damaged child will choose, consciously or subconsciously, or — if there’s little or no resilience built into her or his life by family, friends or community members — which outcome is most likely. Some people don’t think anything can be done to prevent violence by examining a person’s childhood. But it is possible, and it’s being done now, in trauma-informed schools, trauma-informed hospitals, by trauma-informed pediatricians, in trauma-informed public health departments, by trauma-informed judges, and in trauma-informed mental health clinics, and in trauma-informed communities. If you lift the corner of a murderer’s life to peek into his or her childhood, dollars to donuts you’ll find many ACEs and not many resilience factors. The question and challenge is: How can we prevent babies from growing up to become murderers? The first step? Ask the right questions. great post ! he’s reported to say he did it for his religion. what kind of religion promotes the murder of an 8 year little boy? i don’t think it’s islam, and i hope they will repudiate him. also hope he’s not executed – killing to teach that killing is wrong, too expensive, he gets off too easily, there is always hope for redemption with time. All religions show history of killing; not limited to adults. Most wars are started because of religious beliefs. ok, good point, tho I’m not sure all religions advocate killing, j a lot of people have killed in the name of their religion. pretty sick. Fascinating – thank you!! Have shared on my BreakingTheCycles Facebook page and Twitter and will circulate widely – very much appreciate you raising this kind of awareness about ACEs and what trauma-informed hospitals, schools, pediatricians… can do to prevent violence (and addiction and bullying and suicide and domestic violence….) by helping children understand the impacts of the ACEs they’ve experienced and what can be done to treat (re-wire) the damage done by those ACEs to their developing brains — before it’s too late. Reblogged this on ACEs Too High. Shared on FB and Twitter. Thank you! I posted this piece to my facebook page and intend to share it with all of my co-workers. ACES is the first thing I thought of when the brothers were identified. My hope is that others in positions of influence will also consider how the seemingly relentless adversity faced by these young men affected and changed who they became. Thanks, Margaret. It’s interesting how many people who know about ACEs immediately thought the same way you did. I intend to send this out far and wide. Thank you for your suggestions Barbara. What would happen if all of us reading this post printed it out, mailed it to every one of our elected officials, National, State and Local, all educational officials and to the police at all levels? If only 5% of them started to be curious what might happen? All of this is just so sad, for all concerned.